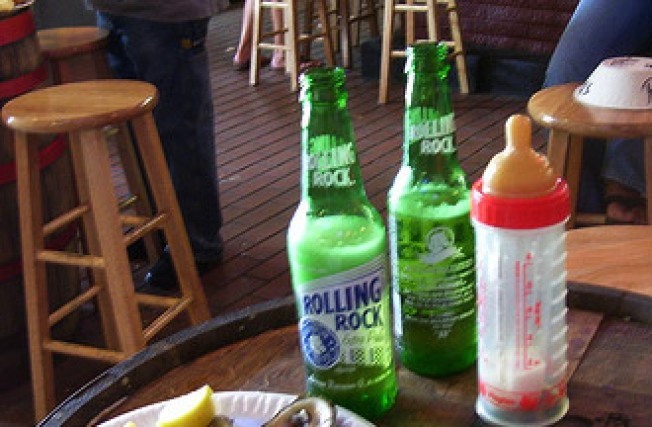 Mommy and baby can both hit the bottle at a new happy hour in Greenpoint. And now Greenpoint's Pencil Factory is institutionalizing ladybreeders getting tipsy with their Bugaboos in a public place with "Mom and Baby Happy Hour," which takes place every Thursday from 3:30 to 5:30PM (at which point, we suppose, the real drinkers get out of work). So many questions! Are daddies welcome too? Will the bartender offer to warm little Mackenzie's bottle for you? Seeing as the point of happy hours is usually to imbibe as much as possible, at what point of fitshacedness is a mommy with an infant in her care officially cut off? And as Gowanus Lounge asks, will there be a breastfeeding circle too? After all, this is the same neighborhood that brought us a certified lactation consultant. Perhaps infamous breastfeeder Kelly Rutherford can stop by in-between scenes (or divorce proceedings).